Views from the loch. : Halcyon days! Photo 01 - Most of our anglers yesterday! 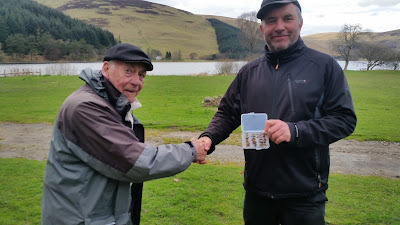 Well yesterday saw our annual wild Trout competition take place on what was a bitterly cold and at times very windy day. As if that was not enough there were periods when we were shot blasted by hail making for a thoroughly trying day! The words fishing trip gave way to endurance test rather quickly! Mitigating this however were small bursts of sunshine passing on small quantities of much needed heat. Thankfully Cath, Lisa and staff at the Glen Cafe served up filling bacon rolls and most welcome piping hot coffee! We are always assured of a great welcome at this establishment and we are most grateful to all of the staff for putting up with a group of ravenous anglers. So thank you Cath, Lisa et al we very much appreciate all you do for us! Photo 02 - Worthy winner, Alan Ramsay receives the cup from our own Pete Young! Come ten o clock all the competitors were at their respective areas giving their flies a good drooking! Sunk lines, floating lines and intermediates were all in action as the anglers searched for the elusive Trout. I heard on the grapevine that fish had been contacted but were just as quick throwing the hooks and swimming away. Due to the conditions no rising Trout were spotted and sub surface fishing was the order of the day. News arrived that Trout hunter extraordinaire Stevie Nimmo had landed a decent fish and that the ever young elder statesman Pete Young had caught a fish but had returned it because he felt it was a tad thin, what a sportsman! I headed over to the roadside on the trusty Zephyr and it soon became apparent that another fish had been caught this time by Fraser Patterson a very adept fly fisherman. Photo 03 - Pete presents Stevie with a 2nd prize a box of loch flies. So a contest was on the cards and I headed to the boathouse to pick up the scales and made for the Tibbie for the weigh in and post mortem barbeque. Slowly the competitors assembled all pummelled by the weather with weary casting arms and blue fingers and toes! Courtesy of Alastair, a roaring fire in the barbeque keg provided some much needed warmth as the reviving aroma of cooked burgers wafted around! Two of our regular competitors Mark and Alan appeared and I heard Mark say that he had one but it got free which is always a disappointment. Alan however was holding a carrier bag and within were two Brown Trout, time for the scales methinks! 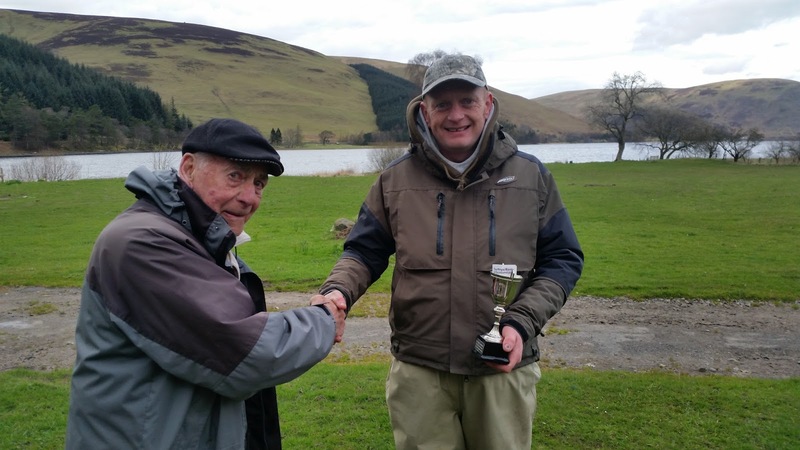 At the weigh in three anglers had Trout Stevie Nimmo who weighed in one Trout for thirteen and three quarter ounces, Fraser Patterson who weighed in one Trout for ten and three eights of an ounce and Alan Ramsay who weighed two Trout for one pound six and seven eights of an ounce! 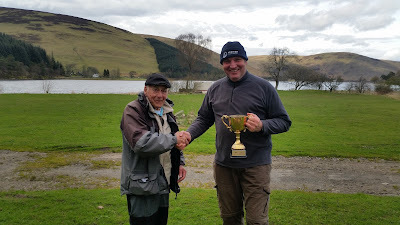 Photo 04 - Fraser receive the heavy Pike cup and £20.00 from Pete. A clear winner then, Alan Ramsay takes the Westbrook cup and we will welcome him and a nominated companion to the Upper Pavilion in the autumn to see if we can tempt a Salmon. He will also receive a year's complimentary membership of the club for the year. We were all delighted for Alan as he has been a most keen competitor for a number of years and it really does lend weight to the saying that “perseverance pays”! So an excellent day despite the atrocious weather, a group of committed real anglers not a Muppet or angling bully in sight! It really doesn’t get better than this! Alastair rounded off the day with a tasty al fresco barbeque with burgers, cheese, all sorts of veg and a massive pot of freshly cooked chips! Of course we very much appreciate Alastair’s efforts and without the Tibbie and the Glen Cafe our day would be a much lesser event! Now over the last few years we haven’t fared too well on the Upper Pavilion but Alan is an accomplished Salmon angler and accrued a tally of 22 Salmon off the Tweed last year so all eyes will be focussed on him to get a few tips. Twenty two Salmon is an incredible feat given the poor fishing on the Tweed last year! 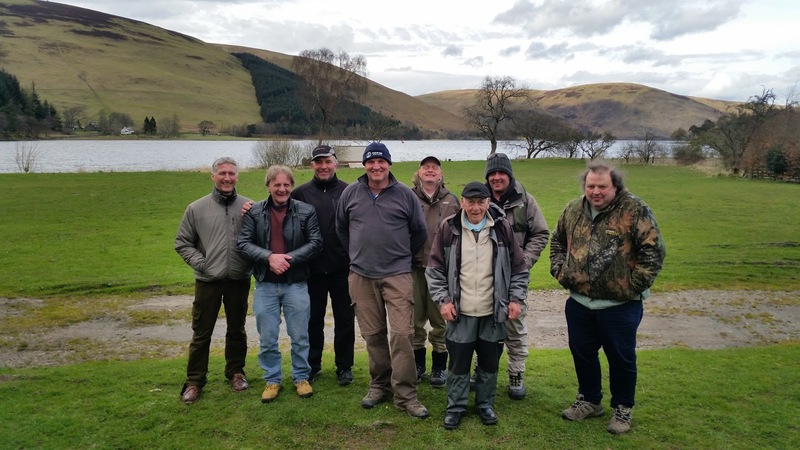 It was a great day out in the company of these lads; this is what real angling is about! Another great memory indelibly printed on our minds, Halcyon days indeed! 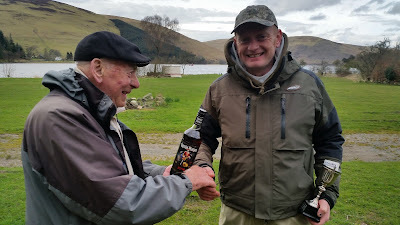 Photo 05 - Fraser receives 3rd prize a bottle of spirits from Pete. It has often been said that we are a progressing society improving our lives leading to a greater sense of physical, mental and emotional wellbeing. Of course it’s a load of tosh! We are all expendable foot soldiers moved by those who control the wealth in our society. Thats it in a nutshell, mere pawns at the beck and call of the wealthy! Certain factors make the situation worse like Tory governments who dismiss concepts such as society, welfare and compassion! They believe only in market forces, devotees of Adam Smith they foster concepts such as the workshy poor, the disruptive union members and above all encourage excessive greed at every opportunity! Greed is in fact the driving force of capitalism the goal seems to be its good to get some, but much better to acquire more no matter the cost to others! Butcher Thatcher really started the ball rolling with the appalling sale of council homes for absolute peanuts! Oh indeed there was minimal return in financial terms for selling councils it could not be any other way! Here we had people who had not the wherewithal to get on the housing ladder receive a golden gift and from a Tory government! Greed is now firmly entrenched in our society and it can be seen on any street in the land! Some trade their cars in when the toffee nosed lot across the street do, other go for more than one vehicle or a conservatory. Now I’m not saying it’s wrong to have nice things because it’s not, a few material possessions makes life so much sweeter! If it had stopped here then it would have been bearable but alas it has gotten much worse in fact completely out of hand! We have become oblivious to human characteristics such as care and compassion replacing them with the pursuit of wealth and the more the better! Sportsmen earn colossal sums of money for doing what is likely their hobby. Company directors exploit their staff paying as little as they can get away with to increase the pot for their own use. Companies all over the globe use every trick available to avoid paying taxes to increase their pot of gold. Large companies, banks and financial houses pay their senior staff huge amounts of money even giving them massive bonuses when they mess up! It seems for some there is no limit to the amount of capital than can be accrued! Just look at the recent scandals in the motor industry with Volkswagen and Mitsubishi deliberately falsifying emissions data in order to increase sales of their vehicles and with that their profit! These people will stop at nothing to increase profits, where is the sense of fair play or gentlemanly conduct or downright honest business? These companies behaved like feral cats in getting what they want irrespective of the cost to others. This tier of capitalism sees no holds barred and anything goes. Unfortunately this is only the tip of the iceberg there will be many more such scandals! This rampant greed must be curtailed before it destroys our society completely! What is beyond comprehension is why does everyone try and ignore what is going on! Do we really just live for this generation for if we continue on this path marked out by Butcher Thatcher there will be precious little left for the next! We cannot sit back and leave it to Lord Snooty and his ace band of bunglers for they are part of the problem! There must be another way where everyone can share in the wealth created. The stumbling block of course is inherent greed! It may be that the only way to stop this is an apocalyptic event such as wiped out the dinosaurs! It would of course be better if we could acknowledge our misguided ways and get back to treating people as people and cast aside the values introduced by industry wrecker Butcher Thatcher! The only political parties offering any kind of change along these lines are firstly the Greens and secondly and to a much lesser extent the SNP. We are at a crossroads here and everyone has an important decision to make, I know which road I will be taking!